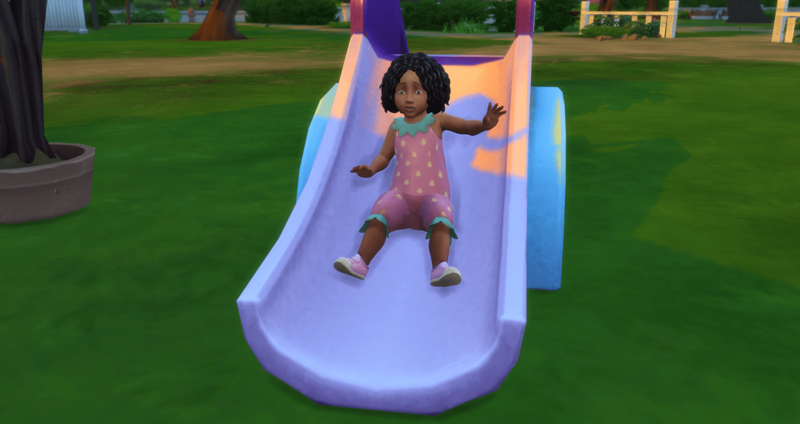 The SUPER mini-challenges (SUPER-maxi challenges because they sure aren’t mini challenges) will either happen or not, depending on how the family does in reaching the tops of their careers, completing aspirations, completing collections, and maxing skills. I think these changes will reduce MY stress levels with the challenge. Getting back to Xia, I was so excited that Xia could marry Don, that I did stop to think if she should marry Don. So he moved in instead. 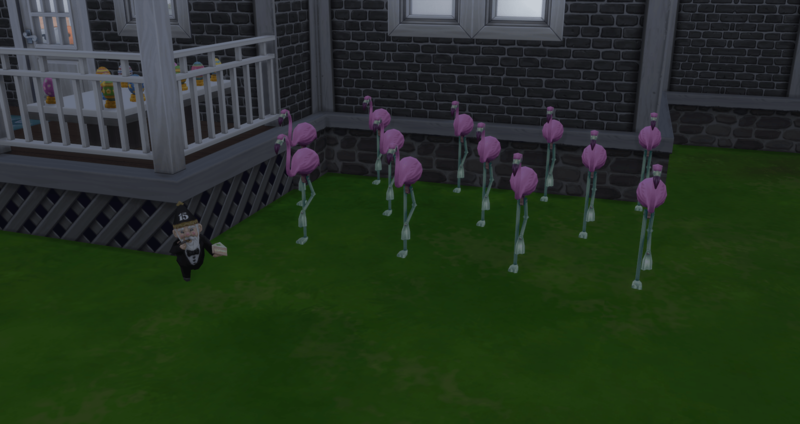 The flamingos have increased in population to account for Don, Buffy, and Bunny. 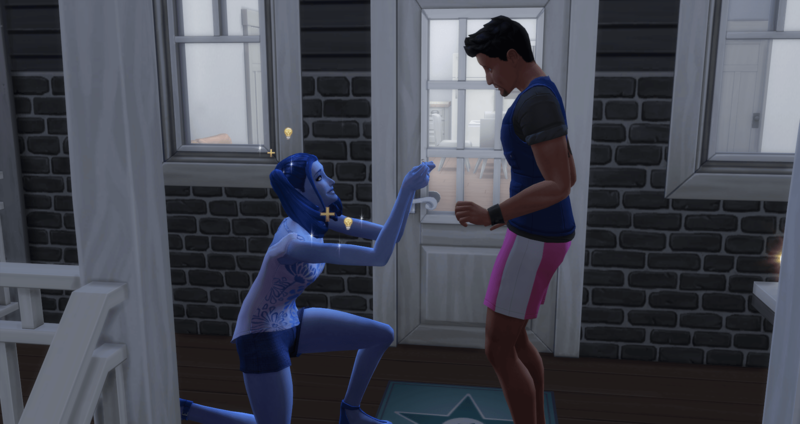 Don apologizes for rejecting Xia’s proposal and promises to be a good partner, even if he wants to be a serial romantic and really doesn’t want to get married. It is a good thing I don’t have to complete the spouse’s aspirations. In fact, there isn’t anything in the rules that says I can’t change Don’t aspiration, so I think I will change it from Serial Romantic to Soulmate, to keep it within the original category of Love, but change it to one I am willing to work on with him. 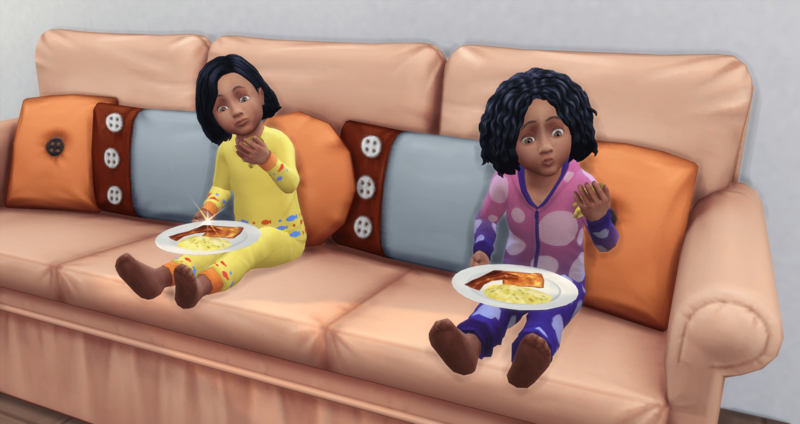 When I got home from the coast, I transferred the save file back to my desktop and decided to roll it back to just before the twins became toddlers. I had only played through their aging up, so it was a minimal roll back. 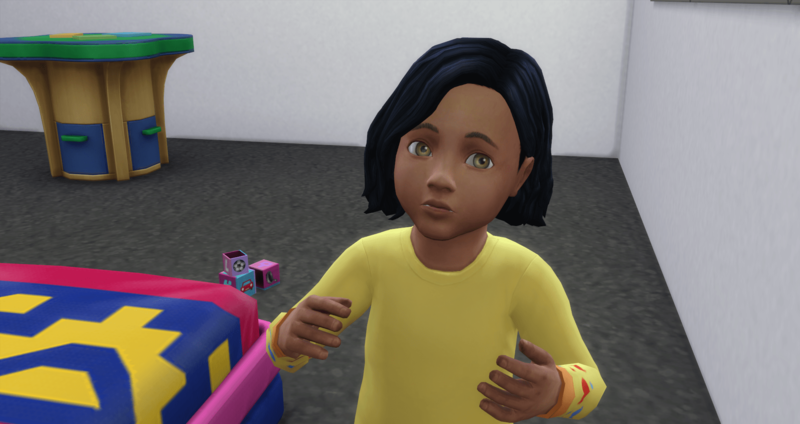 What it did allow was for me to install the mod by graycurse to automatically assign traits and aspirations. This is so cool. 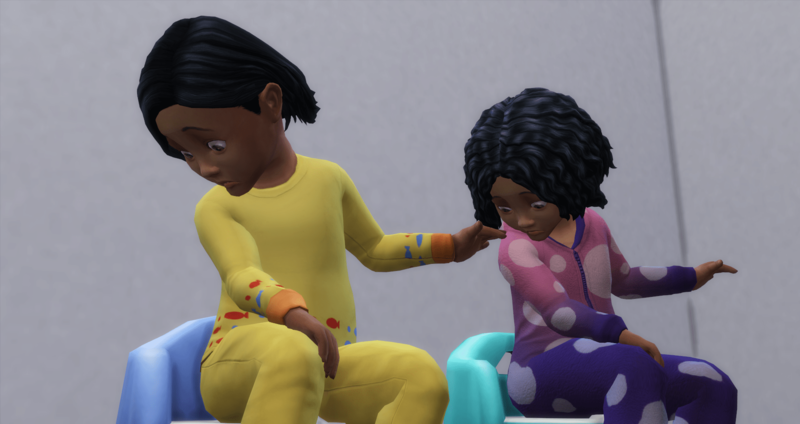 Xia helped Buffy and Don helped Bunny and they both became toddlers without a glitch. Although I am very amazed that they both grew up bald (is that a glitch?). Not a single hair to be found between them. They both need a trip to the dresser, a turn on the potty, something to eat, and then to bed. 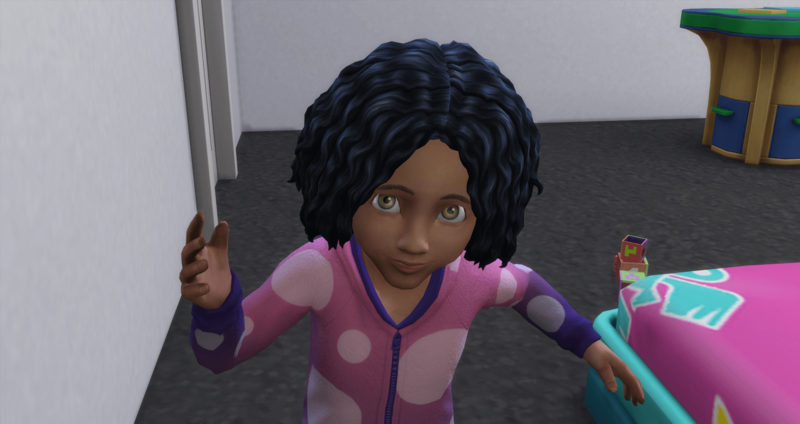 When I took them to the dresser, or rather Don went to the dresser while they went to bed, they both had blond eyebrows but when I selected their head and eyebrows they both changed to black. I am not sure if they tried to grow up with blue hair, but for now they have Don’s coloring. Buffy is the older twin, and yes, she is named after Buffy the vampire slayer. We are currently rewatching Buffy once again. We watch the series twice a year and this is our first time this year. We are currently on season 4 – the first year of college and the first year of Riley. Buffy is Inquisitive. Bunny is the younger twin. Her name was chosen because this is the name that people would call Buffy whenever they got her name wrong. She is a Charmer. I think the girls are identical twins. Potty training in tandem and synchronized checking of the poops. And they both made stinky messes that Don had to clean up after the girls were put to bed. Xia and Don are trying to build something on the block play table so I can see if the toddlers can play with it. I read that children and up can build and toddlers can only imagine but I want to see for myself. 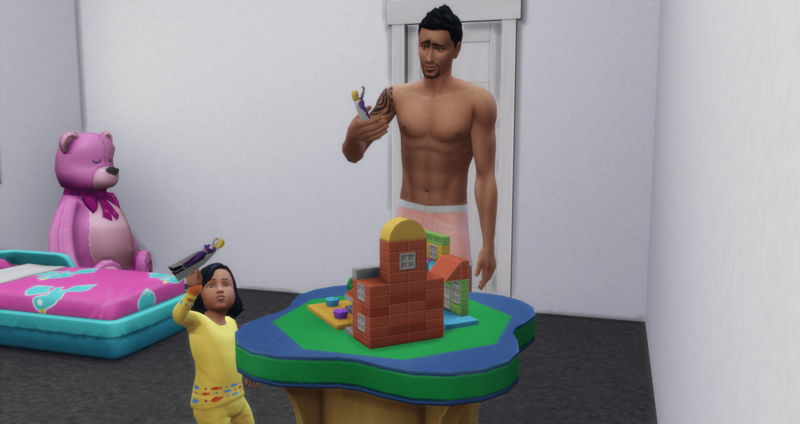 When your daughter wants you to play with her, you play with her – no matter what doll she gives you to play with. While Don and Bunny play with the blocks table, Buffy is working on her movement skill on the slide outside. 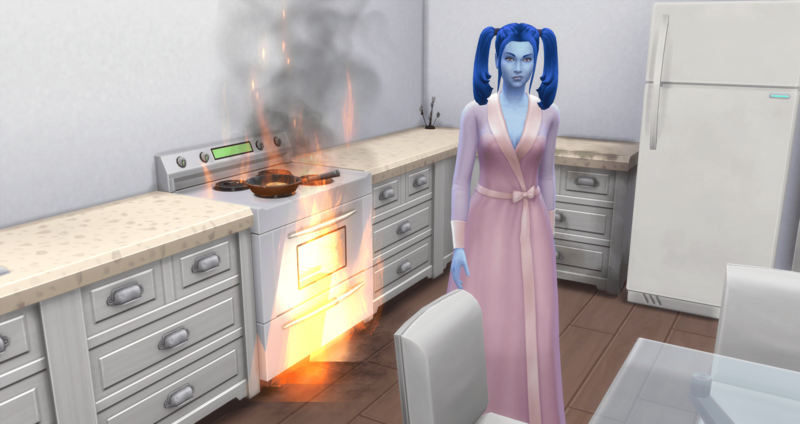 Xia messes up everyone’s day by setting the kitchen on fire. They don’t have the cash to replace the stove, so they will be eating food that doesn’t need to be cooked until someone can earn some cash. Xia, I am looking at you.